A quick-start book aimed at experienced programmers who want to learn Ada at the programming level. Emphasizes syntax, control structures, subprogram rules, and how-to coding issues rather than design issues. Richard Riehle wrote:Public Edition. Permission to copy if AdaWorks is acknowledged in copies. This book is aimed at experienced programmers who want to learn Ada at the programming level. It is not a "...for dummies" book, nor is it intended as a program design book. Instead, this book highlights some key features of the Ada language, with coded examples, that are essential for getting started as an Ada programmer. 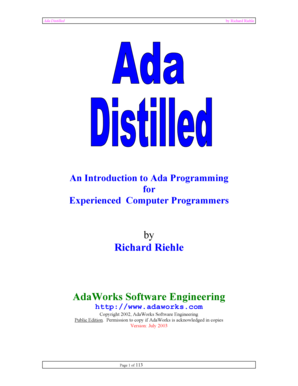 Ada is a rich and flexibile language used for designing large-scale software systems. This book emphasizes syntax, control structures, subprogram rules, and how-to coding issues rather than design issues. There are other really fine books available that deal with design. Also, this is not a comprehensive treatment of the Ada language. The bibliography lists some books that can help readers once they have finished the material in this book. This is a quick-start book, one that enables experienced programmers to get into the Ada language quickly and easily. The examples use text-oriented programs for simplicity of learning. For those who prefers to do the exercises for a GUI environment, check out the sites listed for compilers and tools to download bindings for programming in a variety of windowing environments, including Wintel, Linux, and Unix. Of particular interest to those wanting to explore Window style programming are GtkAda, CLAW, GWindows, and JEWL. The last of these, JEWL, is especially useful for readers who have no prior experience writing Windows programs. Richard Riehle is a Professor of Computer Science and Software Engineering at International Technological University. 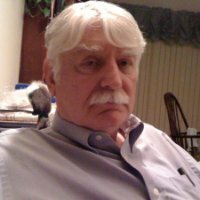 He was a Consultant and Contract Instructor in Ada Programming language to Lockheed-Martin, IBM, CSC, Logicon, Boeing, Intelsat, U.S. Navy, U.S. Air Force, U.S. Army, U.S. Marine Corps, and many other DoD organizations/contractors using Ada as their primary programming language. Also consultant/trainer on software engineering and C++ programming language.